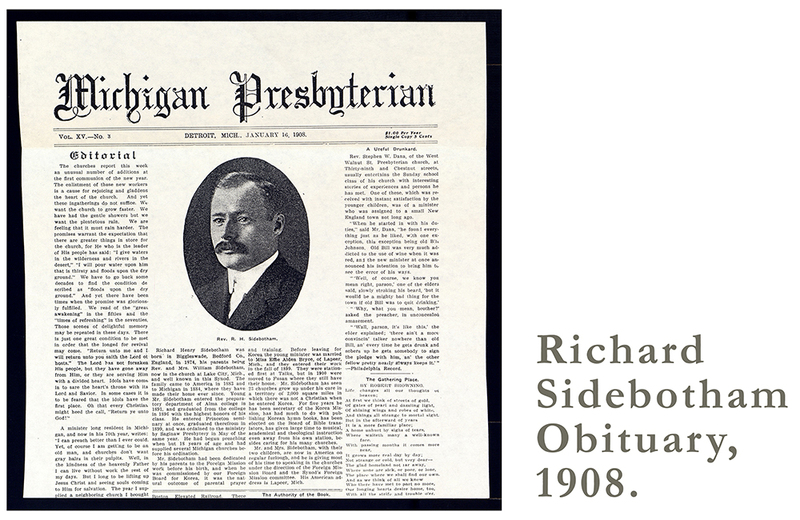 A 1908 article from the Michigan Presbyterian reveals that Richard Henry Sidebotham was born in England and immigrated with his family to the United States in 1883. His father William, a noted Presbyterian minister, and his mother Isabella (Simpson) Sidebotham, dedicated their son to foreign mission work before his birth. Richard attended Alma College and Princeton Theological Seminary and was ordained as a minister by the Saginaw Presbytery in 1899. That year, he married Effie Alden Bryce of Lapeer, Michigan. According to the Presbyterian (1899), Effie was known for her musical talents and was a well-loved figure in Lapeer society. So beloved, in fact, that her friends and family presented her with a piano “seasoned for ocean travel,” before she and Richard departed for Korea in October 1899. The Sidebothams arrived in Daegu in November and the piano followed, arriving in Busan in March 1900. The family ferried the piano up the Nakdong River to their home, and it arrived at the Samujin River Dock on March 26. Porters were photographed transporting the piano from the ferry to the family’s downtown home. At first, locals weren’t impressed with the instrument, naming it “ghost-box” or “ghost-barrel”--guishintong--due to the strange sounds it emitted. The “title” would later be engraved on the piano. Despite this initial distaste, the piano soon became a part of the city’s legend and culture. Since its arrival over a century ago, Daegu has celebrated the instrument, creating piano-themed monuments and public art and hosting annual piano concerts on the dock made famous by the “ghost-box”--supposedly the first piano in Korea. The instrument itself now resides in the Dongsan Medical Missions Museum. Left: Portrait of Richard H. Sidebotham, 1907. 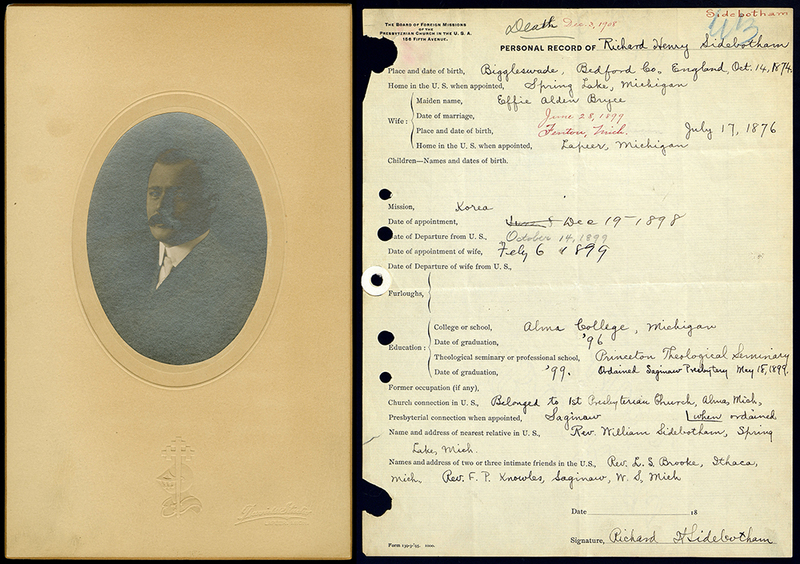 [Pearl ID: 146318] Right: Richard H. Sidebotham's application to the Board of Foreign Missions of the Presbyterian Church in the U.S.A. Unfortunately, other portions of the Sidebotham's legacy would contain tragic notes. Like many of the early missionaries to Korea, the pair faced opposition from the local population. Effie recounts some of the family’s struggles in a brief article published in Woman’s Work for Woman, a publication of the Women’s Foreign Missionary Societies of the Presbyterian Church. Despite these difficulties, the Sidebothams were able to establish twenty-three churches during their eight years in Korea. 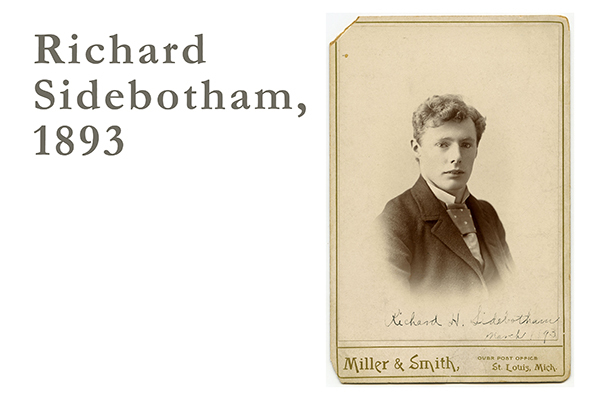 In 1908, the family returned to the United States for a sabbatical granted to Richard. While back in Lapeer, Richard worked extensively, fund-raising for the mission until his sudden death on December 3. An obituary published in The Westminster reported that he mistook a can of gasoline for kerosene and poured it on a fire he was kindling. The explosion was immediate and Richard severely burned. A passer-by helped Effie drag Richard from the burning home, but he succumbed to his injuries later that evening. Surviving Richard, and later Effie, would be their two children, Alfred and Margaret. 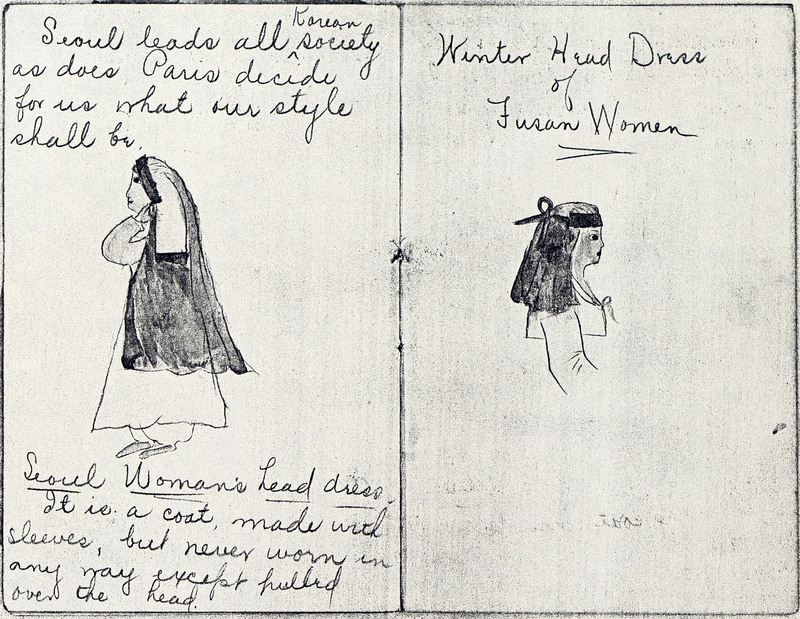 Effie Sidebotham documented Korean fashion through a series of drawings, undated. The Sidebotham’s legacy of cultural connections and mission work continues through the present day. The materials in the PHS collection were donated by Richard and Effie’s grand-daughter, Sarah Curtice Greenfield, who later returned to South Korea to donate the Sidebotham’s effects to the Busan Museum. Their great-grand-daughter, Esther M. Berg, is a mission worker who served in Korea before founding the Zeteo Mission Project in the Philippines with her own daughter, Kate.